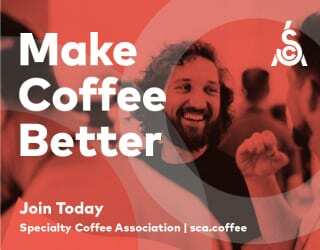 So, you love sipping on a delicious espresso, latte, or flat white at your favorite coffee shop, but wish you could have that same great coffee at home. Well then, this article is for you! Kim Ossenblok and Danilo Lodi are both coffee ambassadors at the Italian espresso machine manufacturer Dalla Corte. They agreed to share with me their advice for brewing barista-quality espresso at home. Preparing good espresso doesn’t have to be as complicated as you might think. 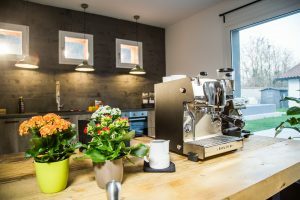 With the correct equipment and a little bit of know-how, you’ll soon be pulling great shots in the comfort of your own kitchen. 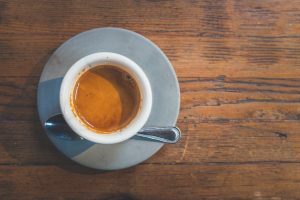 Before we jump into their advice, let’s start by looking at what an espresso actually is. This short coffee is known for its intensity, something that’s created by its small volume and the pressure involved in brewing it. The 20–30 seconds is a good parameter. However, keep in mind that there is no hard-and-fast rule for timing. The behavior of coffee during extraction depends on many factors, including grind size, coffee origin, roast profile, your personal preferences, and more. That being said, let’s take a look at the experts’ tips for improving your home espresso. The coffee’s roast profile is also important. Roasts that are too dark can taste bitter, while ones that are too light may taste too acidic and lack sweetness and balance. As Kim said, the roast date is also important. Coffee is an organic product: it goes stale over time. However, there’s also such a thing as “too fresh”, especially for espresso. Coffee needs to degas; this is the slow release of (perfectly harmless) carbon dioxide that has built up during the roasting process. At the beginning, the coffee degases rapidly, which can disrupt the extraction of flavor and aroma compounds. However, if the coffee degases too much, the flavor will be reduced and it will also be hard to achieve crema. Additionally, it’s best to buy whole bean coffee and store it somewhere away from oxygen, sunlight, and too much heat (or fluctuating temperatures). The only exception to this rule is if you’re using a poor-quality grinder. Danilo recommends purchasing small amounts of coffee at a time to make it easier to keep it fresh. “If the coffee bag has a ziplock, take the air out by squeezing the bag and keep it away from the light, heat, and humidity,” he adds. Good equipment won’t guarantee a good espresso, but it does make it a lot easier. The two most important things you’ll need are a grinder and an espresso machine. Kim suggests investing in a flat burr grinder. He tells me that not only will it start faster, but it will also give you a more uniform grind size. “You should look for stability in the pressure, temperature, and volume of water. The machine should give you the same result from the first cup to as many as you want,” Danilo advises. Make sure you ask about the boiler. Kim recalls buying his first ever machine, a Dalla Corte Mini, back when he first started in the coffee industry. He tells me that one of the reasons he bought it was because it has an independent group head boiler. 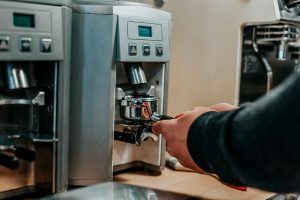 He wanted to practice latte art and knew that the independent boiler would allow him to use the water vapor without jeopardizing the machine’s stability or his espresso consistency. Of course, it’s also worth considering user-friendliness. While it’s great to have a machine that gives you complete control, this is no good if you’re not sure how to use all the features. 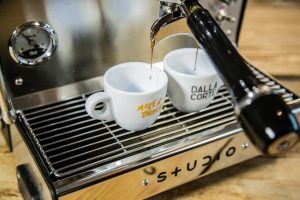 Home espresso machines such as Dalla Corte’s soon-to-be-launched Studio feature control panels that allow you to adjust temperature, dose, pre-infusion, and more. Look for a machine that you are confident in your ability to use. Oh, and don’t overlook the importance of maintenance. Danilo recommends cleaning the machine every time you use it. “This will help you have your equipment working properly for years,” he says. Plus, he adds, it’s best to change the water at least every two weeks if you’re not using the steam boiler. Remember when we said that degassing leads to stale coffee? Well, degassing speeds up dramatically after the coffee is ground. The fresher the grind, the fresher the taste. 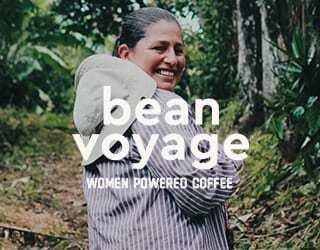 This is why whole bean coffee is typically best. What’s more, when you’re ready to grind the beans, you need to consider the grind size. Grind size is important because it affects the rate of extraction of the flavor and aroma compounds in your coffee beans. The finer the grind size, the quicker extraction takes place. Controlling the degree of extraction is key to good-tasting coffee. This is because the first compounds to be extracted create fruity, acidic flavors; the next ones are responsible for sweetness; then, finally, we get bitterness and astringency. 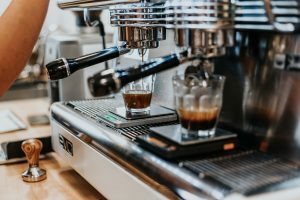 When brewing coffee, the goal is to get a well-balanced coffee with plenty of sweetness and a reasonable amount of acidity and bitterness. 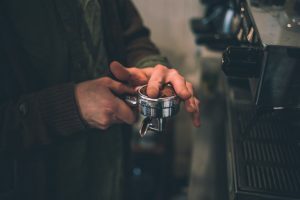 As the same time, the grind size affects how quickly the water can pass through the coffee – or, in other words, how long it takes to pull an espresso shot. If the grind is too fine, it becomes like wet sand, and it takes a lot longer for the water to make its way through. This then increases the brew time and therefore the degree of extraction. Kim tells me, “The grind should be sufficiently fine that it takes more or less 20–30 seconds to pull the espresso shot. If the grind isn’t sufficiently fine, the espresso will take less time. And when it takes less time, you can’t extract the sweetness in the coffee and instead are left with the more acidic and salty flavors. In other words, grind size is critical if you want a delicious espresso. The coarser the coffee, the faster the extraction, leading to less bitterness and more perceived acids in the cup. The finer the coffee, the slower the extraction, resulting in more bitterness and less perceived acids. Espresso always requires a fine grind size, due to the short brew time. However, if your espresso isn’t tasting quite as you’d like, you can try tweaking the grind settings and see if this resolves your problems. How much water should you use? Well, that depends on how strong you want your coffee to be. Kim recommends starting with a 1:3 ratio. 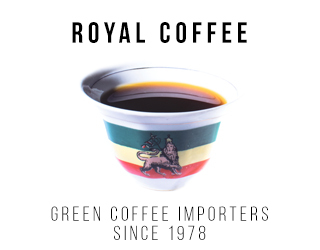 For every gram of dry coffee, you want 3 ml of espresso in the cup. However, you can also experiment with different recipes depending on your preferences. Use 1:2 for a stronger coffee or, if you’re aiming for something more like a lungo, try 1:4 or even 1:5. Remember, there is no “best recipe:” there’s simply the recipe that best suits your coffee and your tastes. However, regardless of the recipe you choose, it helps to measure the coffee and water with a scale. You’ll notice that many specialty baristas weigh both the ground coffee and the extracted shot. This allows them to use exactly the right ratio and ensure the exact same delicious coffee every single time. And it’s a process that’s easy for home baristas to also do. It’s not just about how much water you use: it’s also about what kind of water. Poor-quality water can damage your equipment. Hard water, in particular, can lead to limescale build-ups that can affect the machine’s performance. What’s more, water quality can influence the taste of the coffee. If your tap water has been treated with chlorine, it can make your espresso dull. Water that’s too hard can lead to dull brews. On the other hand, soft water can leave your coffee flat or lacking in body. As for water temperature, you can experiment with this to impact your extraction: the hotter the water, the faster the flavors and aromas extract. However, Kim advises sticking to 90–93ºC/194–199ºF. And finally, you’re ready to pull that espresso shot. But stop: before you begin, what happens if your coffee is unevenly distributed in the portafilter? The simple answer is: bad coffee. 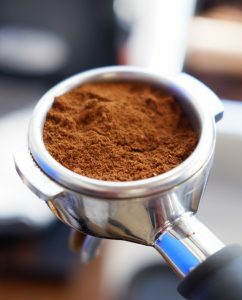 Good-tasting coffee relies on the idea that the different coffee grounds are all extracted to the same degree (or as close to it as possible). 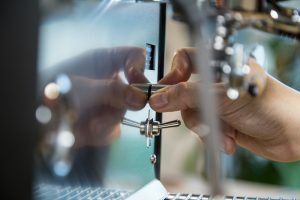 But if some of the grounds are packed tighter together in one section of the portafilter than in another, then the water will choose the path of least resistance and flow through the area with more air. This will lead to these grinds being over-extracted and the others, which are less exposed to the water, being under-extracted. So, before tamping, make sure the grounds are uniformly distributed. If you grind directly into the portafilter, you can move it around during dosing to help ensure this. There are also many techniques and tools that you can try. Distributing coffee grounds in the portafilter. Check out A Video Guide to Tamping Coffee! And now, finally, after grinding your coffee, selecting your ratio, and tamping, you’re ready to pull that amazing espresso shot. Enjoy it! Written by Gisselle Guerra. Interview with Kim Ossenblok conducted in Spanish.